Pure K9 premium optic crystal award. A blue half globe is mounted on the top portion of the clear crystal engraving panel. This award offers two engraving locations. Acralaser and Acraprint award with base. Your choice of acraprint. Gold leaves or green leaves. Custom colors are available. All 1/2 acrylic and comes in 2 sizes. check out this Wreath Oval Acrylic award with AcraPrinted oak leaves in the wreath design. We believe it's a remarkable acrylic award that has style. 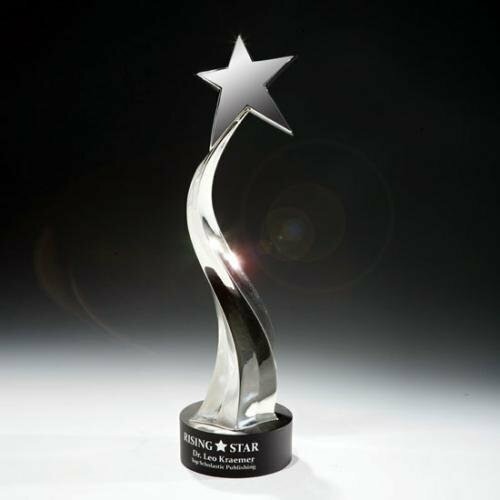 Trace your accomplishment as it races against the sky with our dramatic shooting star award. The Zenith is cast in metal with curving undulations that end in a striking cast metal star plated in silver. The Zenith award is designed to represent growth with its increasing scale, making it an excellent award to recognize achievements or anyone that has shown improvement. A blue crystal accent attached to the base shines through the optic crystal and outlines the beveled graph with a pop of color. The award offers two etching areas, with detailed beveled designs on both top and base. Base attached.